The Scent of Green Papaya spans the life of Mui, an illiterate maid in late 1940s and early 1960s in Vietnam. Concerns for daily bread force young Mui to work as a domestic help in an upper-class family located in a distant city, away from her family. She is innocent at heart, uncomplaining, has keen eyes for observing minute details of her surroundings, and is constantly fascinated by the beauty of the nature. Mui's patience and forgiving nature are manifested when she takes in stride the childish antics of her master's two young sons who seem to have a propensity for urinating outside a toilet, or dragging her washing onto the ground. When she is not working, she spends what little time she has free to explore nature. Mui discovers beauty in smallest of details: a drop of water trembling on a leaf, a parade of busy ants, her pet frog in muddy water, the sunlight through the green leaves, and The Scent of Green Papaya. About two-thirds of the way through the film, Mui's life jumps abruptly 10 years into the future. Mui has transformed into a beautiful young woman, and has developed a strong curiosity that comes naturally with blossoming intelligence. She is now the servant of a young musician who is engaged to a rather flippant young woman. Mui is visibly attracted to the musician. Predictably, Mui turns out to be a home-wrecker and the musician sketches her face and teaches her to read. Sensing an underlying chemistry between Mui and the musician, his fiancé trashes his music room and returns the ring. However, the musician remains aloof from Mui's beauty and we wait for the epiphanic moment when the man will suddenly see Mui through fresh eyes and realize that the perfect woman he has been searching all this while is actually under his roof which he shares with Mui. This is exactly what happens in the film.The film is beautifully filmed. Virtually all of the scenes are indoor - there are no wide open spaces or cityscapes here. The film doesn't use any grand symphony orchestras, but only natural sounds, however, the music is off-putting. 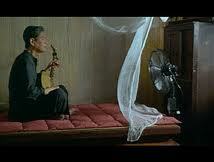 Anh Dung Tran has a strong penchant for visual beauty as each frame of the film gives great aesthetic pleasure. His aim for visual perfection in fact defies and to some extent understates the ugly realities that the family undergoes in the film. The film is tranquil and meditative, doesn't weave a dramatic plot and fiercely follows the growth of a woman. The acting is rather weak except that of Mui's. As much as the director masters the craft of visuals, he fails to produce enough steam so the climax of the film is mostly a foregone conclusion for the viewer. In essence, The Scent of Green Papaya constitutes an example of a visually alluring film that lacks adequate narrative punch, drama, and strong performance. The film was nominated for an Oscar in 1994.